Rebecca Gilby is a student of yoga. Bec has been practicing Ashtanga yoga since 2002. First introduced to the art by a close friend and Yogi, Morrison McQueen www.scarboroughyoga.com in 2000 and is evermore grateful for the gift. Greatly appreciated 5 years of practice with Robert Lucas in Perth Western Australia. Bec is now enjoying life in Coffs Harbour on the NSW midnorth coast and teaching a small number of yoga classes. Bec's background is in biological sciences, and a career in aquaculture and biotechnology with a strong focus on immunologly. Particularly the relationship between stress and immunity. Her academic background includes a Science degree in Biotechnology from Murdoch University, WA in 1991. On completing her degree she worked in the aquaculture industry with fish and shell fish both in Australia and in Canada. She has had five years working in the pharmacuetical industry. Now Bec is studying to become a Midwife and thoroughly enjoying the process. 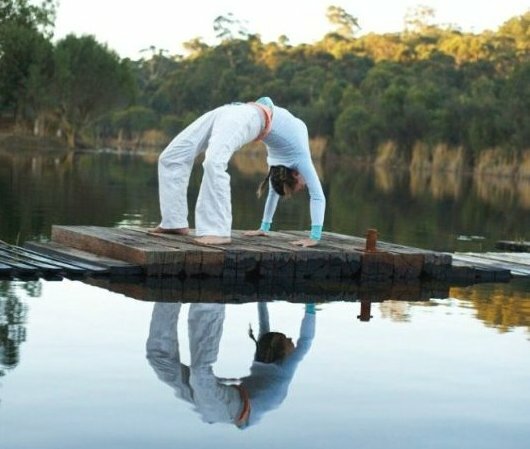 "Personal yoga practice can become an internal guidance system, keeping mind and body in harmony while also allowing change and growth."